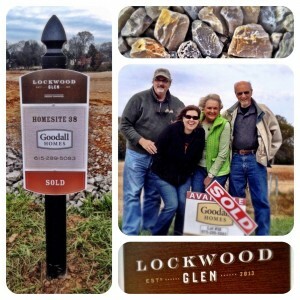 Goodall Welcomes Lockwood Glen "Pioneers"
Goodall Homes would like to congratulate the Dycus family for being "pioneers" at our newest Williamson County community, Lockwood Glen. There is no doubt they will love their new home, and their new neighborhood! Currently, Goodall Homes is offering five different single family home floorplans at Lockwood Glen--and each plan has several different "looks" to choose from. This allows the same home to have a completely different appearance from the outside. To view the available homes at Lockwood, please click here. To schedule a time convenient for you to visit with a New Home Consultant regarding this community, please call (615) 448-8929, or email goodallonline@goodallhomes.com. Lockwood Glen is located off of South Caruthers Parkway in Franklin, 1.9 miles south of Hwy 96.